Reflections and Ruminations: A prevailing “don’t judge me” culture may be making us soft, making us ill-prepared to meet God. A prevailing “don’t judge me” culture may be making us soft, making us ill-prepared to meet God. It is not uncommon to hear people beginning their conversations these days with the phrase “don’t judge me” these days. Oftentimes, this phrase sets the tone of what is to come in the next sentence, which invariably is a revelation of oneself, one’s actions, one’s words used, or even what one has purchased recently. The speaker seems to sense deep inside that what is going to be said, shown or revealed is something that would elicit a negative reaction, and that this would be frowned upon and deemed unacceptable. I wonder if, as a people, we are developing an allergy toward receiving anything negative in terms of comments or thoughts? It does seem to be a real issue, and I’m afraid that it doesn’t bode well for us if we are truly interested in maturing and being adult in life. A person who only wants to hear the things that please, who makes sure that he surrounds himself with people who approve and hardly critique or correct in a fraternal way will only be living in a fantasy world and hardly develop character. Anyone familiar with the life story of Gautama Buddha will know that he really began to develop spiritually and mature in real wisdom only when he saw impermanence and suffering in the world outside of his hitherto mollycoddled existence where he was only surrounded by pleasure and comfort. If we are only open to hearing good things about ourselves, or are not willing to hear things that in some way appraises us or measures us against some standard, we are really not allowing ourselves to become better, either at our work, our craft, or just better people. 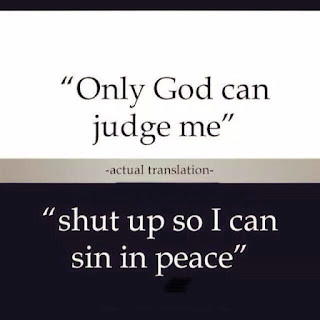 Of course, when our choices in life are objectively and morally wrong, when we say "don't judge me", we are really telling others to let us sin in peace. But if we are true to our conscience, sin and peace are oxymorons. 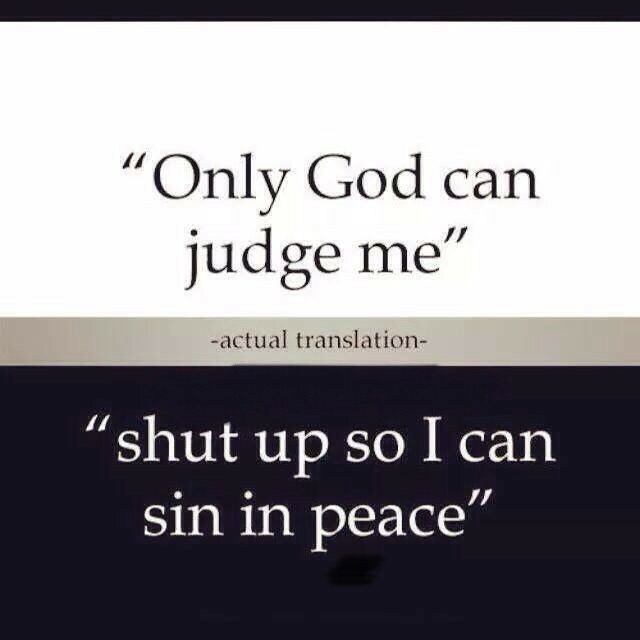 One is never at peace when one sins. Undoubtedly, pride is at the heart of this matter, because it really takes humility (and a large dose of it) to be willing to accept the fact that we can do things in a better way, or live life with a larger heart. It takes a humble heart to say with conviction “I don’t know everything”. The human ego has a natural aversion towards being commented or critiqued, often taking things personally rather than objectively. Anyone who has been a novice in a convent, monastery or seminary will know that fraternal correction is par for the course. This is partly due to the fact that if one manages to reach the point of final vows or priestly ordination, one is going to make the vow or promise of obedience to one’s Superior or the Bishop. The formation that one undergoes is not something that happens overnight. Rather, it is a journey that takes several years, where one’s life is open to the comments, observations and correction of one’s superiors and formators. Taking fraternal correction in the right way is always going to be challenging, because the quest for holiness requires of one to be shown and directed ultimately by the Holy Spirit, who is the ultimate director of our lives. Docility, suppleness of heart and humility are a sine qua non for one to mature spiritually. Imagine if a novice enters the portals of a convent, and takes with her the inner disposition of “don’t judge me” during the coming years of her formation. It won’t take any stretch of the imagination to see how unhappy she will be as a novice, and how hubristic one may end up after final profession. Granted, I am sure that hardly anyone who is reading this week’s reflection is going to contemplate seriously going into the religious life. A glance at the falling numbers of postulants and novices in convents and seminaries will back this statement. But if we are going to take umbrage the words of those who disagree with us, or who are our detractors, telling them that they shouldn’t judge us, we may be the losers in the end, whether we are contemplating living the religious life or not. The virtue of humility is so attractive regardless of one’s state in life. Being used to comments that are negative in this life and listening to others telling us that we could do better, and taking it well prepares us for something that none of us is going to escape from when we die – and that is the judgment that awaits us from God himself. Are we going to find ourselves telling God “don’t judge me” when we meet him after we die, because we had been constantly telling others this while we lived in this life? It may seem to be something feisty and spunky now, but it certainly won’t set us up to be humble when we meet our maker. And undoubtedly it is the ego of self- centredness that is the bane of modern society. It was only the other day that a friend came to share how humble she was to keep her peace during a domestic altercation......but the fact that this “humility” was brandished so cavalierly - does it not denote a ghostly tinge of pride? If we are honest and true to ourselves - shouldn’t one bewail that one just can’t be humble because it’s truly, truly hard to be honestly humble? Yet we know it’s not beyond us because Christ the revelation of God’s love has come to show us the secret....the Way. Through St Paul we learn that the heart of the Christian mystery is the ‘presence of the Divine energy in our ordinary world.’...... this basic energy of all life is Love. (1 John 4:9) And ultimately, to love is to be other-centered. How can one work towards this end? The importance attached to this is not only advocated by our teachers of the Faith but is also reflected in the thinking of two influential thinkers of the twentieth century viz. E F Schumacher and Simone Weil- who described “selfless attention” as the most important quality one can acquire in one’s life-time. This other-centered-ness removes the ego and hence the fear of being (as you said) - “........appraises us or measures us against some standard,” - and be found wanting. No matter what you write - it comes back to His Love- thank you Fr.